This entry was posted on January 23, 2015 by thecladdaghblog. The two birthstones for November are Yellow Topaz and Citrine, the two have of been confused over the centuries as they are both golden in color. Yellow topaz however is considerably more expensive than Citrine, which is a form of Quartz. 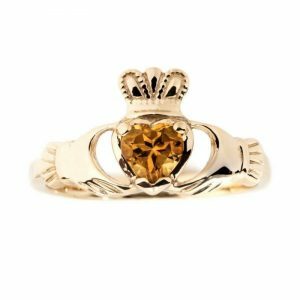 All of our November birthstone Claddagh rings are set with a lab created heart shaped yellow topaz. The word Topaz comes from Sanskrit word "tapas" meaning fire. The rich golden color represents harvest and the sun. To carry a topaz was once thought to bring the protection of the Egyptian sun God Ra. Topaz is also mentioned in the bible numerous times including in the Book of Exodus as one of the gems used in the high priest's breastplate. Topaz is mined in Brazil, Russia, USA, Sri Lanka and some have even been found in Ireland. Topaz crystals have the potential to grow to enormous sizes with the largest cut yellow topaz: the El-Dorado Topaz which was mined in Brazil weighing 31,000 carats. Another famous Yellow topaz weighing 22,892.5 carats, is the American Golden Topaz. The 172-faceted gem took over two years to cut. Check out all our Claddagh Birthstone collection online today which includes Claddagh birthstone rings and Claddagh birthstone pendants.